Do you have guests coming for the holidays? I always wonder what to serve for those meals that are not covered by the big holiday feast. Like the breakfast or brunch that precedes the gathering…everyone secretly hopes those other meals are extra special too. 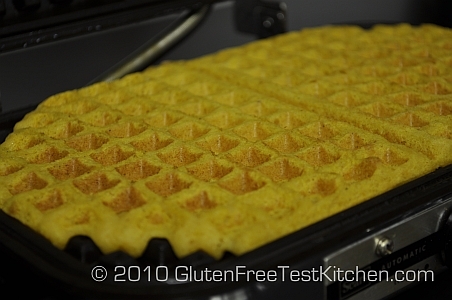 Thankfully, I remembered that I developed a pumpkin waffle version of my gluten free waffles last year. I make my waffles in an elderly waffle iron inherited from my mother. My parents received it as a wedding present. For the most part I am not an overly sentimental person, but I do have a special fondness for the appliance. It reminds me of lazy weekend breakfasts and those special “lets have breakfast for dinner” nights. Most importantly, elderly or not, it still continues to turn out great waffles. 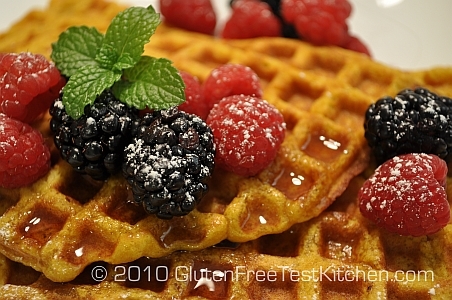 These waffles taste of the holidays with warm spice and mellow pumpkin..the additional bonus is that this recipe allows for guests to get up at different times and prep their waffle from the batter…OR the recipe is moist enough that you can make the waffles ahead of time (store in the fridge or freezer)…then just reheat in a low oven, toaster, or in the microwave. Of course this is also the perfect recipe for a day off or weekend brunch. To make it even more special you can serve with special syrups (homemade or purchased), a selection of fruit toppings, or just a dollop of whipped cream. Preheat waffle iron to desired heat setting. Place dry ingredients together in a bowl and combine. Beat wet ingredients together in a separate bowl with electric hand mixer or whisk. 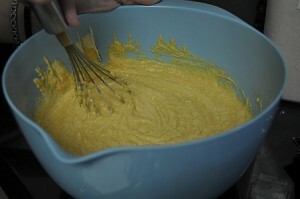 Add dry ingredients to wet gradually. If mixture is too thick adjust by adding additional water. Grease or spray waffle iron. 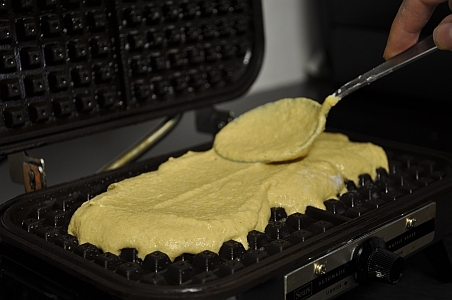 Load batter into waffle iron using a spoon. Underfill as the mixture will rise and spread (our iron takes about 5 heaping Tablespoons). Bake until golden brown. Makes 8-12 waffles. Serve with your favorite syrup and toppings. Delightful gf pumpkin ricotta waffles!! Can you recommend a substitute for the tapioca flour? Here are a couple of other things you can try. If your waffle iron is adjustable, try turning up the heat a bit (or turning it down). The ricotta and eggs make these waffle tender, but they also require a higher temperature and a bit more time. My waffle iron takes about 5 minutes to bake a waffle. If you have a Belgian waffle iron, make the batter even stiffer by adding less water or none at all. Update: I have retested the recipe and here are some of my discoveries. I tested different heat levels in my waffle iron and discovered that lower heat is actually the best for ensuring that the middle of the waffle cooks as quickly as the outside. This prevents that “sticking” you were experiencing. If you attempt to open the iron and you sense there is resistance… do not force… allow the waffle to cook a few more seconds and you will find that it releases once the inside is cooked. I experimented with amaranth and it did work as a substitute for tapioca…however arrowroot might work as well with an iron set on a different temperature. You might want to experiment as I did with differing settings to find what works best. I also found that a batter with less moisture was best.